In prezentul document, Reguli de ENBU in Karate Fudokan - "ENBU RULES - International Fudokan Karate Rules and Regulations" by World Fudokan Federation, publicat in 2012, am pastrat limba originala in care a fost publicat documentul pentru a transmite cat mai corect nuantele si intelesul acestuia. Regulamentul poate fi downloadat in format pdf, vezi link la finalul articolului. Principle of strict respect of basic biomechanical movements, and through long year tradition to preserve old karate techniques – a new discipline was formed - called mandatory En-bu. Second principle is full freedom in aspect of time, space and form - creating new formed (second) En-bu discipline - discipline of wide range of karate techniques - so-called free En-bu. Mandatory En-bu is presented every second year on World Championship by Technical committee. Same as Kumite Competition Area provided in Kumite rules. Court Judge placement is set up as those set up in Kata Competition Rules. Offense and defense demonstrate choreographed sequences for period of one minute (+ or – 5 seconds). Time is calculated from point at which either competitor starts to move and continues until both competitors return to Shizen-tai or directly to Sei-za (formal floor sitting position). As soon as competitors return to Shizen-tai (or Sei-za) the clock stops. No weapons allowed. But in addition to required techniques, any other technique is allowed. Exception: No Nuki-te or finger attack to eyes allowed. In free choice En-bu Offense side techniques must include Choku-zuki (Straight Punch), Mae-geri (Front Kick), Mawashi-geri (Roundhouse Kick), and Ushiro-geri (Back Kick). (a) Attack must be directed at target. (b) Breaking balance is allowed. (c) Grabbing and clinching are allowed. Targets: Jo-dan (face, head area), Chu-dan (stomach area), Ge-dan (low stomach). Required: Proper Todome (Finishing Blow) technique. Breaking balance, grabbing and clinching are only allowed in conjunction with counter-attack technique. Contact is prohibited for both sides except in blocking techniques on arm or leg or when breaking balance. Either alternate both sides in offense/defense or only one side stays as either offense or defense; except for mixed division where only men can attack. Competitors must keep Zan-shin (mental and physical preparedness) between techniques prior to next movement. At the end of the demonstration, one side must demonstrate Todome technique (in mixed, only women’s side). (a) Todome-waza is allowed only one time at the end of the demonstration. (b) In Mixed category, only the women’s side delivers the Todome. A. At elimination time, the scoring shall be determined on the basis of the viewpoint of Judges according to the formula of Basic Points minus Penalty Points. At final match time, the scoring formula shall be Basic Points plus Skill Points minus Penalty Points. (a) Main demonstrators scored on degree or rate of power generated by the body dynamics and muscle action. (b) Main demonstrators scored by degree of smooth continuity of technique combination. (c) Main demonstrators scored by degree of balance (stance, posture and coherence or movements). (a) Correctness of Timing as established by Kumite Rules Article 1-2-A- (2). Degree of Martial Arts fighting spirit including degree of emotional stability, mental concentration, Zan-shin and high character (Kurai). Degree of technical details plus understanding of mental and spiritual elements. This refers to the level of the impression the demonstrators make on the observer as a result of both the realistic and efficient execution of movement, and the display of high level of technical skill with grace and strong spirit. (3) Hesitation or break in demonstration. Remark: See Kumite Rules for contact definitions. All decisions regarding level of contact made by Medical Judge. Remark: Penalty points are cumulative per category. A Han-soku shall be declared against a competitor in the following cases. The Shu-shin’s indication of a Han-soku shall be the holding of a zero card overhead. (1) See Kumite Rules for contact definition. All decisions regarding level of contact made by Medical Judge. (2) Han-soku applies when heavy contact is discovered during or after demonstration. Feigning serious injury during demonstration shall incur the same penalty (Han-soku) as heavy contact. When the competitor seriously violates any of the Competition Rules. Apply Kata Rules (section referring to teams). A. Apply Kata Rules which refer to teams. B. In case of a Kettei-sen, competitors may perform same or different choreography than original. (1) Competitors take starting positions, then bow to Shu-shin and each other, then begin demonstration. Competitors may bow from standing position or Sei-za position. (2) After demonstration, competitors return to original position, bow to each other, then bow to Shu-shin and withdraw from the Competition Area when ordered to by Shu-shin. Remark: Competitors who begin with standing bow must end with standing bow. Competitors who begin with floor sitting bow must end with floor sitting bow. A competitor who begins with standing bow and ends with floor sitting bow (or vice versa) will receive a “no bowing” penalty. (3) Timer reports to Shu-shin the length of the demonstration as to over or under time limit. (4) Shu-shin confirms penalty point, and if penalty confirmed, calls Court Judges meeting to decide penalty points. (Procedures – see Kata rules). (7) Shu-shin shall then request their presentation of the scores by blowing one long whistle followed by one short, sharp whistle. The Court Judges shall each present their scoring by holding their own Scoring Boards overhead. (8) The Announcer shall read each score aloud starting with the Shushin and proceeding clockwise. If a score is misread, the Shu-shin shall request a correction from the Announcer. To direct the Court Judges to lower their Scoring Boards after they have been read correctly by the Announcer, the Shu-shin shall blow one, short whistle. (9) The Announcer shall then announce the average score. (10) In case of tie score, Kettei-sen is held. Court Judges decide without raising Scoring Boards. A. Shu-shin or two or more Fuku-shin indicate heavy contact. Shu-shin must call Medical Judge and tournament Doctors, and then call Court Judges’ Meeting to decide penalty based on Medical Judge’s Report. B. Scoring is based on Standards of Scoring. Regulamentul de karate "ENBU RULES - International Fudokan Karate Rules and Regulations" by World Fudokan Federation, publicat in 2012, poate fi vizualizat sau descarcat si in format PDF accesand acest link. 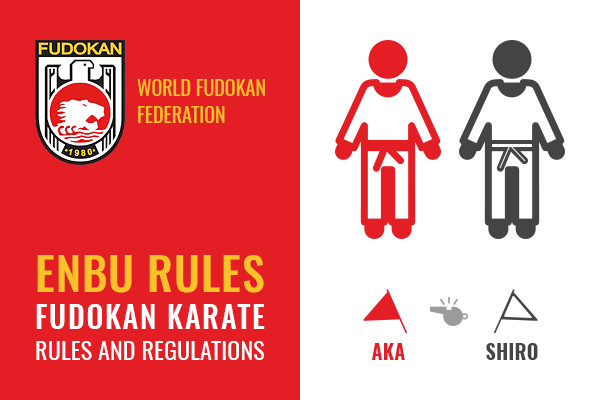 The Karate Fudokan ENBU Rules according to World Fudokan Federation can be viewed as PDF accessing this link or you can order the book from World Fudokan Federation Shop.